This is the original Fruity Pebble Pudding Cookie Recipe! These cookies are soft and sweet and are full of your favorite cereal. 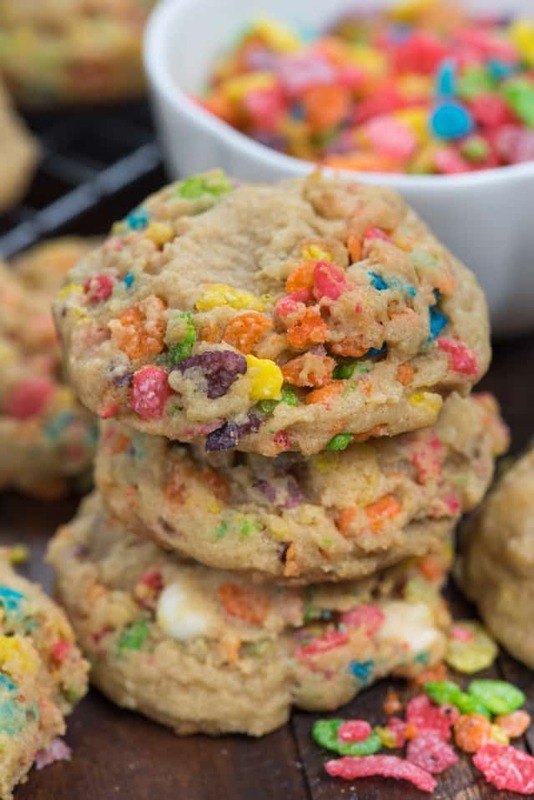 The Fruity Pebbles add a crunch to the soft and chewy pudding cookie, as well as an awesome and unique flavor. These are seriously my favorite pudding cookies ever! If you love Fruity Pebbles cereal, you’re going to absolutely love them. They’re like eating cereal and milk inside of a cookie, thanks to the soft vanilla pudding flavor and white chocolate chips inside. I’ve added cereal to pudding cookies before, when I added Cinnamon Pebbles to pudding cookies and Frosted Flakes too. There’s something about adding a kid cereal to a soft and chewy cookie recipe: it makes you feel like a kid again when you eat them. Plus the crunchy cereal adds such a perfect texture to the cookies. I’m pretty sure that Fruity Pebbles are a cult kind of cereal. When I search them on google, lots of people search for Fruity Pebble Cookies, for good reason. They are so good! You make think this recipe looks familiar, if you’ve ever searched Fruity Pebble Cookies on Pinterest, or if you’ve been reading this blog for a long time. I made the *original* Fruity Pebble Pudding Cookies several years ago, and have now updated the recipe and photos to the standard I want them to be. That’s the thing, when you start blogging and don’t know what you’re doing: sometimes very old recipes aren’t quite perfect and/or photos are really bad. That’s why I’m painstakingly going through old recipes updating them and trying to make them perfect. 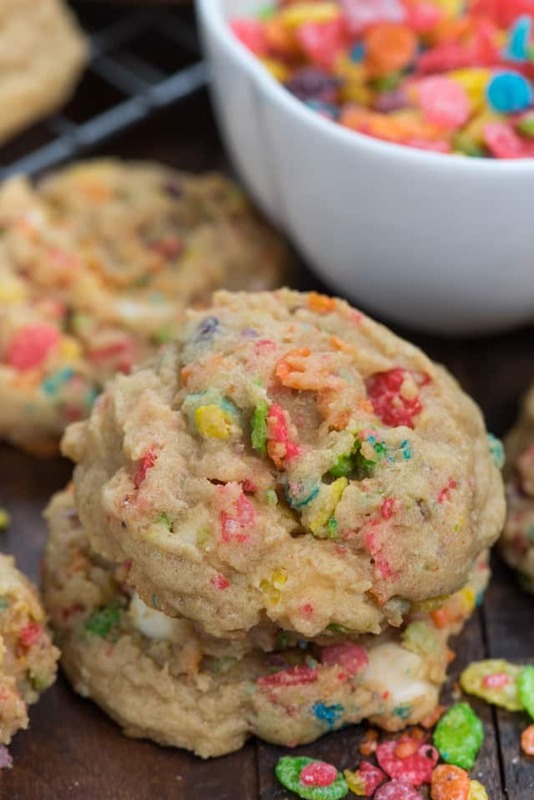 Fruity Pebble Pudding Cookies: the new and improved version! This recipe starts with my favorite ever pudding cookie recipe. Really, that one is the only recipe you need because you can make SO MANY other cookies from that one. You can make Celebration Pudding Cookies or add your favorite candies and chips. Or, let your love of kid cereal take the wheel and make them with Fruity Pebbles or Cocoa Pebbles or Frosted Flakes. My recipe is even better than the Jell-O pudding cookie recipe because it’s full of brown sugar. Pudding cookies are soft as it is, but these? These are extra soft thanks to the pudding and all of that rich and sweet brown sugar. These mix up easily, whether you’re doing them by hand or with a mixer. Once they bake they’re chewy and soft and stay that way for days. Plus, the fruity pebbles add a fun flavor and crunch to the cookie. With the white chocolate chips, they almost taste like a cereal and milk cookie. I can tell you with 100% certainty that everyone you know will love these cookies! People often do a head scratch at the thought but then fall in love once they taste them. Fruity Pebble Pudding Cookies are soft and chewy and the perfect cookie recipe for the kid in you. Don’t forget the pudding mix! You can use ANY flavor INSTANT pudding mix. For these, vanilla or cheesecake work best. Add the powder, not the actual pudding. Note that the dough requires chilling. This ensures a thick and fluffy cookie. Before baking, press down lightly with the palm of your hand. You can skip the white chocolate, if you want. These are going to be a huge hit, so make a double batch by simply doubling all ingredients. 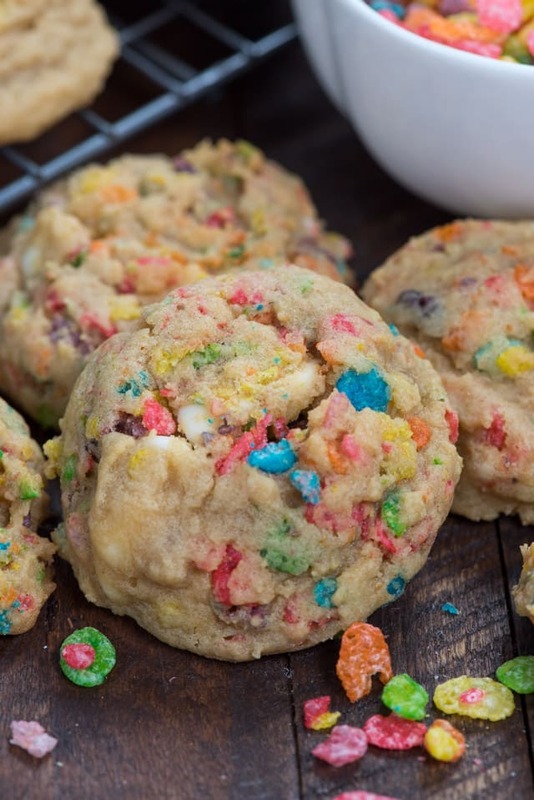 This is the original Fruity Pebble Pudding Cookies Recipe! These cookies are soft and sweet and are full of your favorite cereal. The Fruity Pebbles add a crunch to the soft and chewy pudding cookie, as well as an awesome and unique flavor. Cream butter and brown sugar in the bowl of a stand mixer fitted with the paddle attachment. (You can also use a hand mixer.) Mix in egg and vanilla until smooth. Add pudding mix, baking soda, and salt. Mix until combined. Mix in flour, then stir in white chocolate and Fruity Pebbles. If you love pudding cookies, check out all of my pudding cookie recipes here. And be sure to try my favorites below, as well as some from my friends: Chocolate Chunk Pecan, Lemon Pudding Cookies, or Turtle Pudding Cookies. 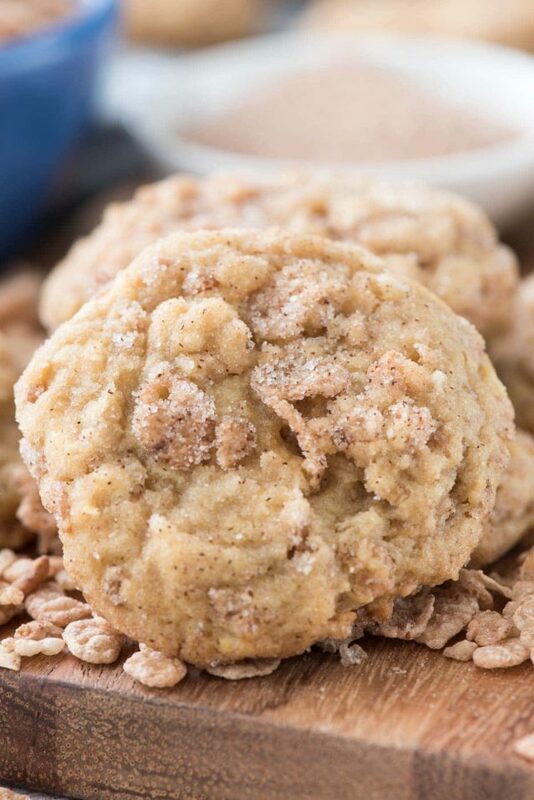 Snickerdoodle Crunch Pudding Cookies have cinnamon Pebbles cereal inside! 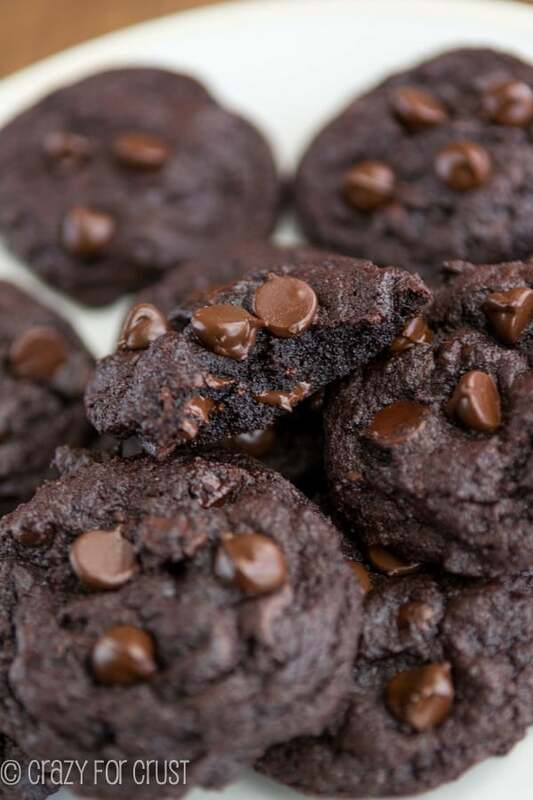 Triple Chocolate Pudding Cookies are for the chocoholics! 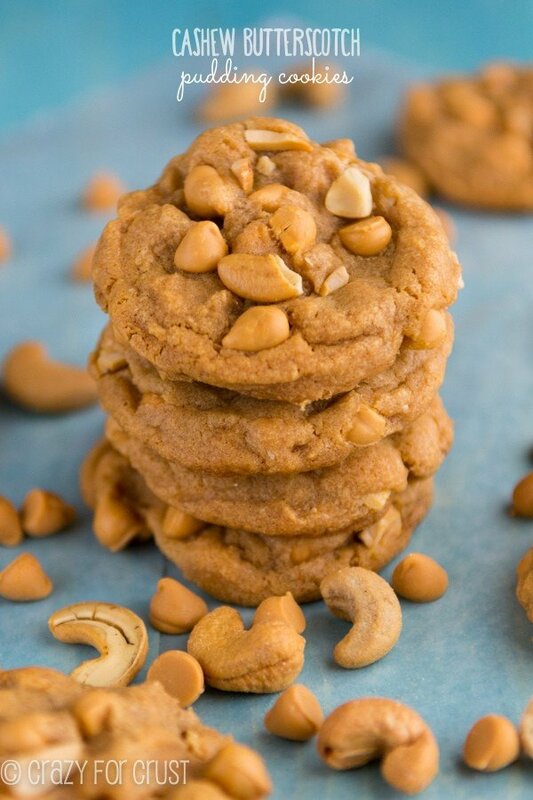 Cashew Butterscotch Pudding Cookies are my favorite combo ever! These distinctive cookies are tasty, fun and festive, the kind that make people go, “Ooh, what are those?” when you take them somewhere. I made a double batch but all I had on hand was one large 6 serving, 5.1 oz. box of pudding. I also added a few drops of Lorann cotton candy flavor for a little something extra. My only problem was that the dough was extremely dry and stiff even after adding a tablespoon of milk. So because of that, the cookies don’t spread much during baking. I had to flatten the dough balls a bit so I didn’t end up with golf ball looking cookies. I think if I had used the full amount of pudding, it would have been even worse so I might suggest adding a couple tablespoons of milk to the liquid ingredients, especially if you’re going to chill the dough for an extended period. Once I added the pudding mix I thought surely this doesn’t have much flour. I agree it was too dry. I think next time I’ll add less flour or as you said some milk. Loved them! They came out so good!